Miles and his best friend talk after he learns for detective Maria Hill that Spider-man was not responsible for Prowler’s death. With everything happening to America his school closes down so he heads to the “Ultimate’s base”. Here he meets Captain America and asks to join the Ultimates. Cover- Absolutely epic in every way! 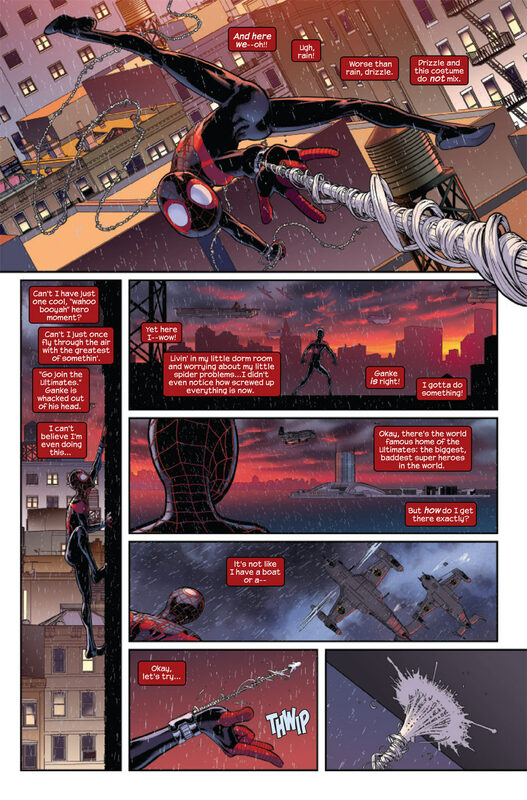 Nick Fury is in the background, Miles Morales is front and center while he’s flanked by Captain America, Iron Man and Thor. I am extremely satisfied with this cover. Art- Marquez continues to turn in good art. Humor- You can always count on this book to give you a good chuckle. Miles Tearing out the ceiling of his room with webbing and later tripping on wet flooring and siding between Cap’s legs, priceless! Let’s also not forget his friend’s suggestion for becoming the most popular superhero ever, chuckle. 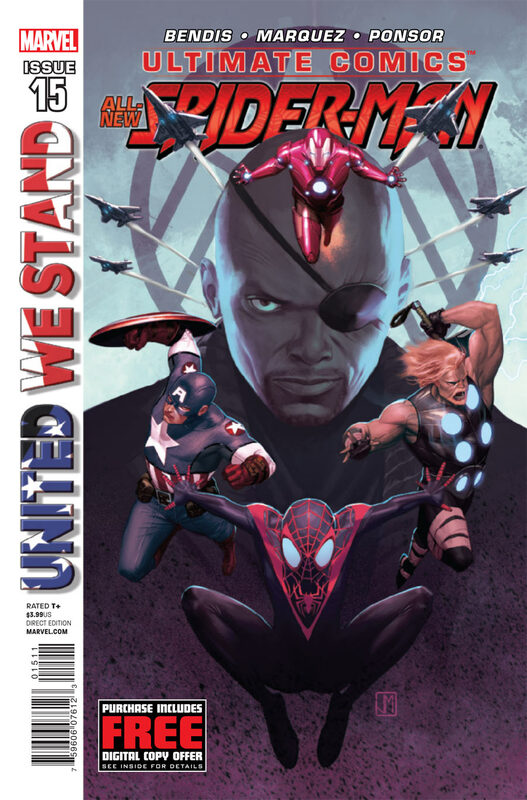 Black Hero- Miles makes a bold move this issue by telling Cap he wants to join the Ultimates. I’m curious to see where this leads since the Ultimates are a very over the top gore filled group very different from the Avengers or X-men. Down time- This issue’s greatest strength comes from the moments with his friend Gankhe and his family, these moments are really the highlight of this series. Sure the action is great, sure the dialogue is hip and sure it’s funny but it’s the tense emotional moments when Miles is with his friend and parents that you can’t help but just love this silly kid.